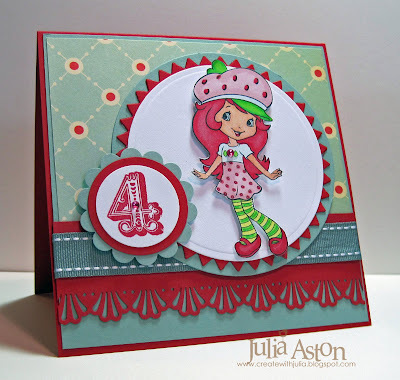 Todays card was made for the Featured Stamper challenge on Split Coast. Dawn (flowergirl36) was honored today. I chose this pretty Frosty Twigs card of her's to case. I changed the stamp to a twigy wreath by PSX rather than a twiggy snowman and changed the location of the ribbon due to the size of my stamp - and I added a sentiment by Papertrey Ink. I loved her idea of the glitter background stamping and used that with a different background stamp (Pine Needles & Cones - Cornish Heritage Farms). I stamped the image using my Palette Stamp & Stick Glue Pad - then covered it with glitter. Before I was able to stamp tonight - I spent the afternoon teaching a class at The Papertree, in Manchester, NH which is about 1 hour from where I live in MA. Michelle is the owner up there (Hey Michelle!!) and she has the most wonderful stamping shop! I teach a class there about once a month and always do a lot of shopping before I leave! Today we made a double pocket bag (tutorial here on Split Coast) and an apron recipe card holder (tutorial here on my blog) for holiday gift giving. 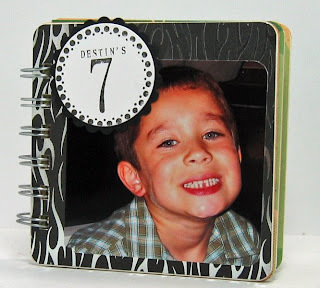 We used several stamps from Just Rite Stampers and one from Amuse. 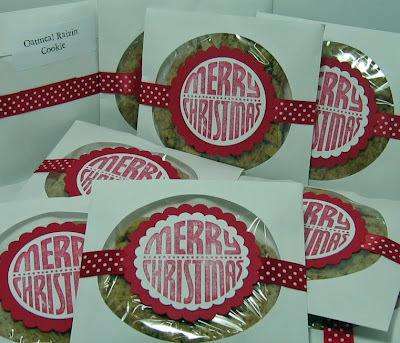 I also gave everyone a packet of Swiss Miss Cocoa and 2 home made biscotti since that was the recipe they put on the card tucked into the apron. 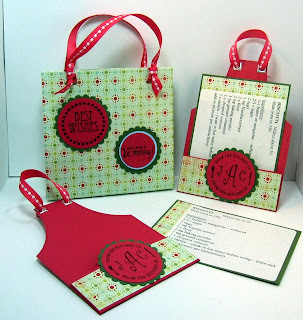 This apron can slip into the double pocket card - or it also fits in a regular size envelope for mailing. 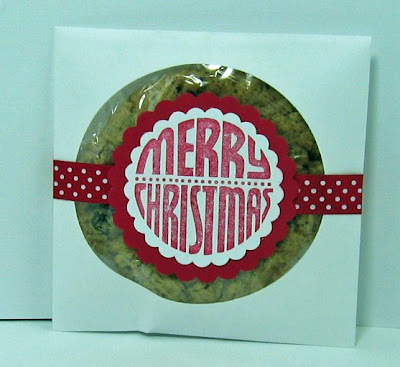 I'll be posting my biscotti recipe tomorrow morning (12/1) with my H&M Stamps Creative Gift Wrapping blog hop - so be sure to check it out! And a big shout out to Linda, Debbie, Lisa and Maddy my fun classmates today! 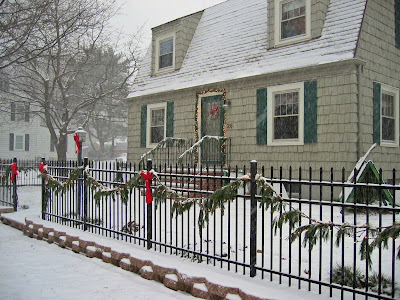 It was snowing in NH so that really put me in the holiday mood - unfortunately - it was just rain at home! Thank you so much for taking time out of your busy day to come by and say hello!! 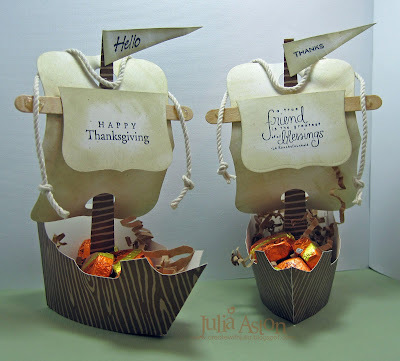 Aren't these just the cutest little Mayflower Boats???!!! 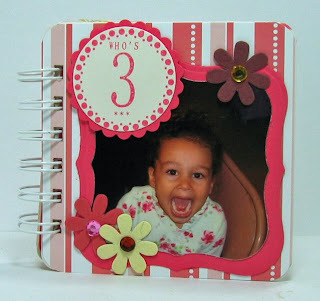 Qbee has posted her wonderful templates here in the forums over on Split Coast Stampers. I stamped my boats with a woodgrain stamp from All Night Media. She didn't include a sail - so I just drew one from a picture of the Mayflower I found when I Googled it. Of course the real one had many sails - but you get the idea!! I distressed and sponged the edges of the sail and curved it a little to give the feeling of the wind filling it - I attached the top and bottom edges to the mast with super tacky tape. You need strong adhesive because when you curve the sail - there is a little tension and the sail wants to pop off the mast! I stamped the names using my Just Rite 2 5/16 round wooden stamper and the Brayton 50 point font letters. 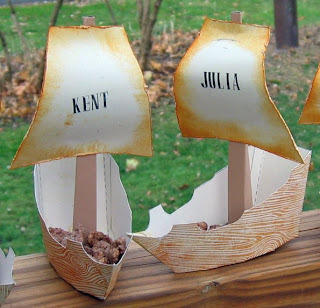 I will be sailing these ships to my sister's for Thanksgiving to use as place names on her dinner table. 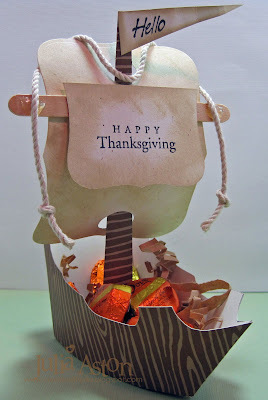 I hope you try these for your Thanksgiving table! 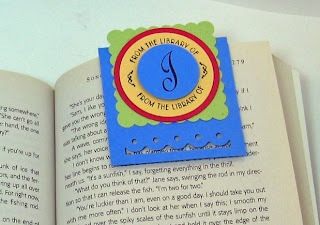 Monograming a Book Mark - and some Special Offers! 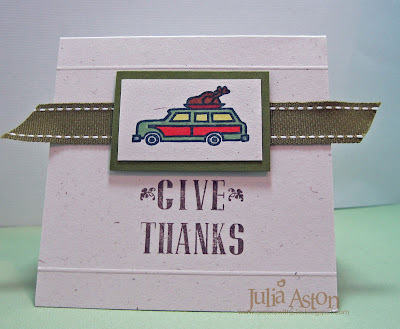 Today's Ways to Use It challenge was to use a monogram of some sort on your card. I have acquired a lot of the Just Rite Monogram stamps (!) and am so happy to use some of them here! I made a magnetic bookmark - starting with a piece of 5 1/4 x 2 5/8 card stock that I folded in half. 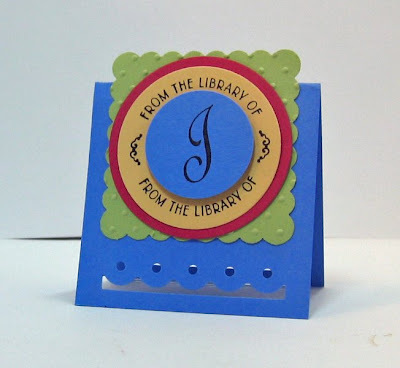 The font of the J is Special Occasions and the 'from the library of' comes in a separate borders set. First I stamped it on yellow - then on blue - then just punched out the J with a circle punch from the blue one and attached it over the yellow with a foam dimensional. I cuttled the green square with Swiss Dots. I punched the bottom with my Fiskars Treading Water punch just centering it and punching once. I attached two pieces of sticky magnet strip inside on each panel. So this little bookmark is covering a lot of territory today! Here is a picture of it in use. Just snapped over the page and the magnets on each panel holding it on. and a couple of special offers for you today! Heather has reduced the prices on ALL of her stamps so hop on over to H&M Stamps to check that out. and - Kristin is offering a free stamp grab bag to everyone who orders $25 or more - this is good until 10/12 so get over to Artful INKables quick to get in on that special before it's gone! And last but not least - I just reached 40,000 hits and to show my total appreciation to you all for coming by here - I'll be posting a "Really Big" (as Ed Sullivan used to say) blog candy on Sunday - so be sure to check back! Accessories: treading water punch: Fiskars, strip magnet, scalloped square punch: Marvy, foam dimensionals, circle punch; SU, Circle nestabilities, glassine envelope: Oriental Trading Co. Here is my card for today's color challenge on Split Coast - to use So Saffron, Wild Wasabi and Almost Amethyst on a card as well as for the Double Dare challenge I do with a small group of friends on SCS. Michele (sf9erfan) is today's hostess and her directions were to use the alphabet on your card. 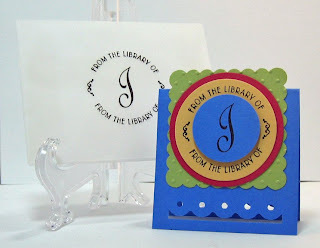 I used my Just Rite Monogram stamper to make a monogramed note card for myself using my 'alphabet' initials! I don't have Almost Amethyst so I used a Bazzill purple that I hope is close to it? 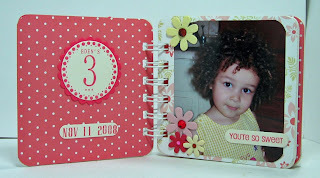 I used the polka dots folder with my cuttlebug to emboss the card and my circles are made with Nestability circle dies. 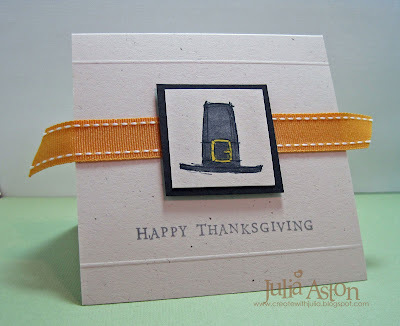 This was so quick and easy and will be a great note card to use for Thank You's etc! If you'd like to see the other Double Dare Alphabet cards as well as all our challenge cards - check here. Happy Friday everyone! We had a gorgeous summer day here in Massachusetts today - sunny and warm but with a breeze and no humidity - not many days like this! I have two cards to show you today - first is my card that I made way too late last night (or early this morning!) for the Ways To Use It challenge on Split Coast - to use a photo on your card. My DH and I went to Ireland a year ago in celebration of our 10th wedding anniversary and I took a gazillion pictures. 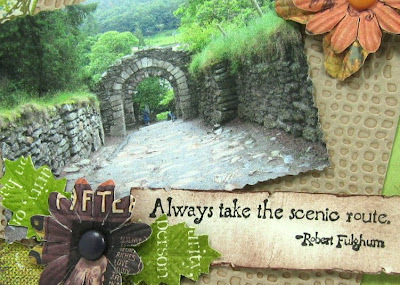 The picture on this card is of the entrance to St. Kevin's Abby. I printed it on watercolor paper and cut the edges with dekle edged scissors to make it look like a photo edge (the way they used to when I was young - although they had a white border then also! does anyone else remember that?). I layered the photo to a cuttled panel and a DP panel, sponged everything in Close to Cocoa and added these great new Prima artful flowers and leaves. Aren't these flowers beautiful? 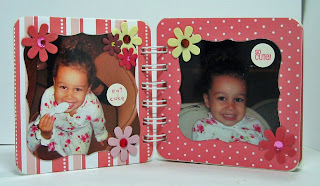 and I love how the picture printed on the watercolor paper - it looks almost three dimensional here don't you think? Accessories: Dekle edge scissors, primas artful collage flowers & artful leaves, sponge, foam dimensionals, distresser. 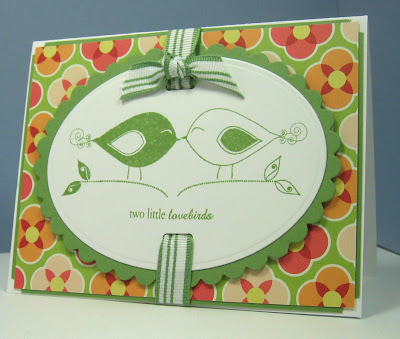 My second card was made for the Limited Supplies Challenge - to use a knot on your card. I was asked by a friend to make a wedding card for her to give to her niece and she wanted it personalized and to use Wasabi color. Luckily (!) I recently purchased the Just Rite Monogram stamps so was ready to take this card on! I attached the ribbon to the back of the panels and then used a shorter piece and knotted it around the flat ribbon twisting it so the dots showed on each end of the knot. I cut the circles with my nestabilities and added dew drops on a few flower. This pretty paper by Die Cuts with a View has glitter already on the flower centers - don't know if you can see that in the picture. Thanks so much for stopping by and taking the time to look at my creations - I'll be checking out your blogs too - leave me a comment so I can hope over to see you! Have a great night! Happy Wednesday everyone - it was rainy and cool here(around 60) all day with more of the same for the next two days - but then it's supposed to be 88 and sunny on Saturday - Yay! I made this card for today's Sketch Challenge on Split Coast. This is the sketch we were to use. A friend at work asked me to make a 2 graduation cards for her. 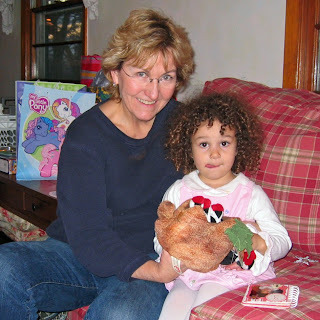 Her niece, Erin, is graduating from U Mass Boston and she needed a card for Erin's parents to give her as well as a card for herself. Hopefully we have the correct school colors on these! I wanted to use my Just Rite Monogram stamps to personalize it and today's sketch with the circle and lines worked out perfectly. The ribbon is navy although it looks black in the picture. Here is the sentiment on the inside of the card. Here is the 2nd card I made using the same colors but a different sketch. 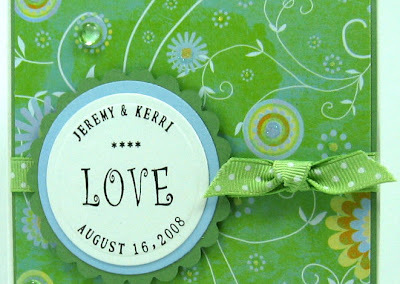 On this card I used a Spellbinders tag die for the sentiment and attached it to the dotted ribbon with foam dimensionals. I also added ribbon under the Nestability circles. 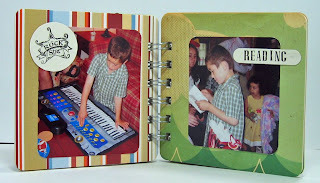 I used the Distressed Stripes Cuttlebug folder on the white panel. Here is the sentiment on the inside of this card. Thanks so much for spending some time here today! Todays Try a New Technique challenge was called "The Whole Enchilada" : to make 3 3x3 cards, envelopes for them and a box to put them in - a tall order for a small set!! You can find patterns for the box and envelope here (scroll up to the top of the thread once you get in there). I had so much fun making this set today - the patterns worked beautifully. And these are my initials so I guess I'll have to keep this little set for myself!! LOL!! 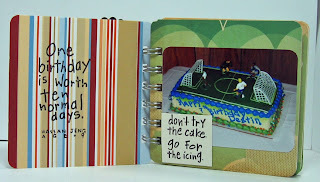 I used a heavy designer paper by My Mind's Eye called 29th St. Market for my box and my cards. I used my Score Pal to score the folds on the box. I used my nestabilities to cut the scalloped and plain edge circles. And I got to try out my brand new Just Rite DIY monogram kit with the Curlz Font and leafy border. The circles are attached with foam dimensionals. The ink is Mountain Rose by Adirondack. The envelopes are made from thin designer paper from an unknown stack. 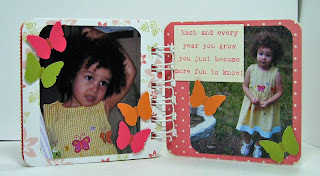 I stamped a flower by Imaginise on the corners with versamark and embossed it with vanilla embossing powder. They seemed to match the flowers on the box and cards pretty well. I used velcro adhesive squares to hold the box closed - I got those at Home Depot while there with my DH one day. Here is a picture of the cards tucked inside the box and you can see the velcro closure. I hope you will try making a set of these if you haven't done so before. 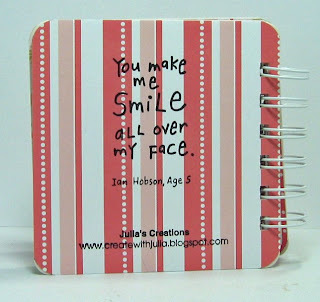 They could be used for all kinds of things - thank you notes, little gift enclosures - what uses can you think of? ?